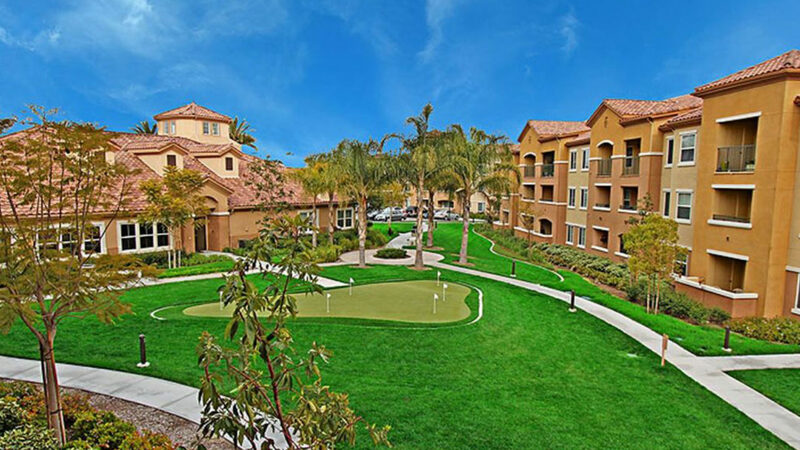 Grand Isle Senior Apartments is a 453 unit upscale senior apartment complex located in Murrieta, California. Four buildings were occupied at the time of the Receiver’s appointment and four additional buildings were in various phases of completion. The property also included a detention basin and future dog park for which additional improvements were required. Douglas Wilson Companies (DWC) was charged with securing the subject property, overseeing ongoing operations and lease-up, and maintaining entitlements. DWC managed all operations of the site including accounting, leasing, maintenance and oversight of the six on-site employees. DWC oversaw the collection of all tenant rents, coordinated with Housing and Urban Development for low-income qualified tenants, reviewed vendor contracts of the property for pricing and scope of services, and continued to correct life safety and other issues on the property. DWC also secured building permit extensions for the four partially complete buildings, and identified potential refunds to the property from deposit accounts with the City of Murrieta and Southern California Edison. The Plaintiff foreclosed on the property and DWC facilitated transition to the new owner.